Giant tree "Osugi of Sugisawa" that appeared in "Anecdotes of Japan"
There was a place to visit before I saw "Miharu no Taki Sakura". It is "large cedar of Sugisawa" which stands in village of satoyama surrounded by hills. The largest tree in Fukushima Prefecture is located in Nihonmatsu City in the north of Nakadori. As you look closer, the magnitude of its existence will stand out. The thick roots that firmly lay on the ground, the branches that rise up to the sky will overwhelm the viewer. It is a huge one-piece cedar with a height of about 45m and a trunk thickness of over 10m. 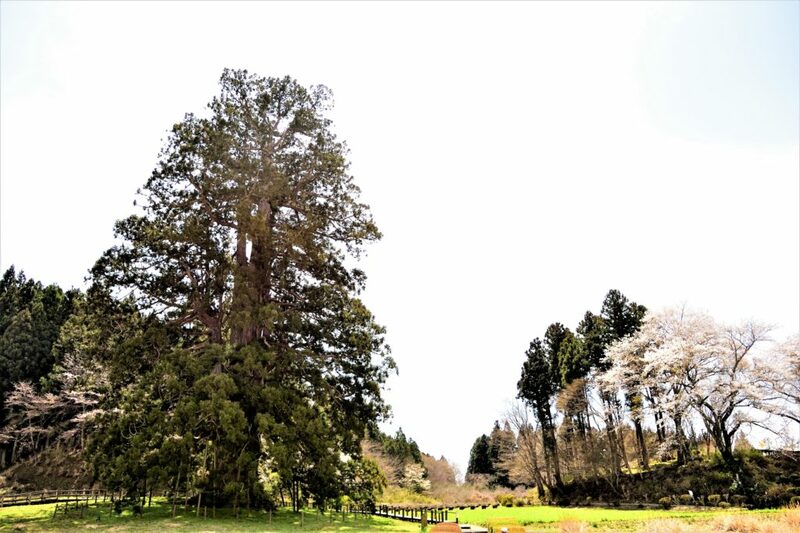 It is said that it is bigger than Yakusugi, which is more than 1,000 years old, and there are not many cases of cedars with strong trees in this large tree. It is not only a huge one, but it is a mysterious large cedar that boasts an elegant standing appearance and has also appeared in "Manga Japan Old-fashioned Without". It was designated as a natural monument of the country in 1949 and has taken root in this area for a long time. It is said that the tree is about 600 years and a millennium, and we have watched the Edo period when it was spent double. It has been protected by people as a local treasure. Miharu-cho is said to have been named because plums, peaches and cherry blossoms bloom at once. We visited one of Japan's most famous trees, "Miharu no Taki Sakura". "Miharu Taki Sakura" is a beni-didazakura that is one of the three major cherry trees in Japan. It is said that the age is over 1000 years. It is counted as one of the three major cherry trees in Japan, along with "Neo Dani Mizakura" in Gifu Prefecture, and "Yamataka Jindaisakura" in Yamanashi Prefecture, and its graceful appearance is also a model of numerous paintings. It is a special feature among many cherry blossoms, such as the unique taste of an old wood, full of vitality, and the imposing figure that captures the hearts of many people and also models of the works of the painters Meiji Hijimoto and Hiroshi Senju It is an existence. 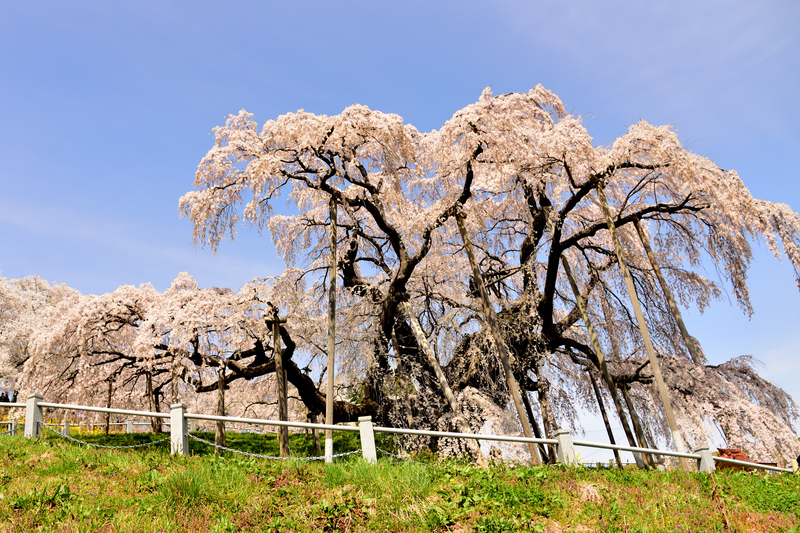 It was the first cherry tree designated as a national natural monument. The tree height is 13.5m, the root turn is 11.3m. Floating in the night sky "Miharu Takizakura"
Spread branches in all directions, bloom countless pretty flowers on drooping branches, countless sighs, and it is just like "Grand champion". Perimeter 11 meters, height 13 meters. The branches are 25 meters wide. Many people are attracted to the overwhelming vitality of this Miharu waterfall cherry tree, and tourists from a distance and people in the area view the same cherry tree together and share its beauty. In the cherry blossoms area, you can enjoy the delicious food of the local area, and the laughter is constantly and constantly, communication is also created between young tourists and the elderly in the area, and warm time passes quickly. The day fell, the light was up, and the pink flower that bloomed in the fluffy rose in the night sky. There are approximately 10,000 other cherry trees in Miharu-cho, of which approximately 2,000 are fern cherry trees, and trees over 100 years old are planted throughout the town. The "Sakura Park" and "Miharu Dam", which has about 2,300 cherry blossoms, are also known as famous places, and the whole town is colored in cherry blossoms during the flowering period. There are various activities that symbolize the cherry blossoms in Tohoku such as "Tohoku-Dream Sakura Highway", "Sakura Line 311", "Sakura Namiki Project", "Sakura Project 3.11", "Fukushima Sakura Project" and so on. The purpose of the activity is to realize the future where we do not repeat the sadness we experienced again, wishing for reconstruction and revival from the Great East Japan Earthquake. There are a wide range of activities including cherry tree planting business, Tohoku cherry blossom tourism promotion including inbound, disaster prevention teaching, education and cultural activities, and spread enlightenment business. In 2011, British female director Lucy Walker entered the affected area, made a short film called "Tsunami and Sakura" and was nominated for an Academy Award. In the movie, cherry blossoms that try to make beautiful flowers bloom even if exposed to a tsunami are superimposed on the victims who want to live brightly and positively even if they stand on the edge of despair It shows how important it is to culture.